← Yes, chess. Look away now. Griffith Pugh (1909-1994) was a pioneering exercise physiologist and member of the first successful Mt Everest expedition in 1953. Sir Edmund Hillary would later describe Pugh as the man who ‘made it possible’ – no exaggeration given Pugh’s contribution to virtually every aspect of the Everest Ascent, from oxygen delivery, to fluid and food intake, to boots and clothing. Griff Pugh’s daughter Harrriet Tuckey’s biography of her dad (Everest – The First Ascent), recently reviewed in Physiology News, is on the short list for the prestigious British Sports Book of the Year Award – you can support and vote online by 9 June. And indeed, why not do just that? It is a great book (I’ve read it and reviewed it), and as the author, and various other people (including me) have pointed out on Twitter, it isn’t every day – or year, or decade – that a book about a physiologist, or indeed about any scientist, is up with a chance of Sports Book of the Year. Mostly one expects sportspeople’s autobiographies, probably ghosted. In case you hadn’t guessed, I might have had a bit of a hand in alerting the Physiological Society to the upcoming vote, as it was me that reviewed the book for Physiology News. However, it was actually here on OT where I first came across Griff Pugh’s name – fifteen months ago, in a post by Frank Norman entitled ‘High Altitude Boots’. Full story below, for the very hard up for something to read. But the MAIN point of this little post is to say: please READ THE BOOK. And vote for it, if you feel like it. You have two more days to cast your vote, as voting closes at midnight on Monday June 9th. Frank’s post, the first place I ever came across Griff Pugh’s name, appeared in March 2013 and explained how Frank had been delving into the archives at the National institute for Medical Research trying to find an obscure article Pugh had written. He was doing this at the request of Harriet Tuckey, who needed a copy. 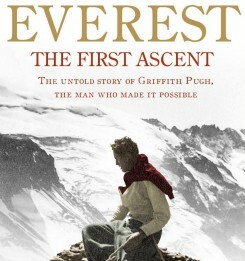 Harriet had written her father’s biography, due for publication a couple of months later on the 60th anniversary of the famous first ascent of Everest in May 1953. I’m not sure exactly what it was that pricked my interest about this, though the mention of Pugh’s being a physiologist was certainly a big part of it. Perhaps the connection to NIMR, where I did some of my PhD work in the 80s (though, as I later worked out, not on the same site) helped? Or was it the likely connection, as I guessed at the time, to Prof John West. the doyen of human respiratory physiology and historian of high altitude medical research? My better half (aka ‘The Boss’) owns one of John West’s textbooks from her years as a trainee anaesthetist, and I had consulted it from time to time – including once to work out if a hangover ought to help your tolerance of 3000 m altitudes. Or perhaps the connection to the Everest Ascent, something I recalled my mother, who was a teenager in 1953, talking about – the news came through on the day of the present Queen’s Coronation – and that had been held up to us at school in the 70s as an example of British derring-do and achievement. Whatever it was, I recall mentioning it to my better half when I got home that day. At which point she told me that she had heard Harriet Tuckey being interviewed on Radio 4 a few days previously. What had really caught ‘Er Indoors’ attention was Harriet’s explaining how she had really only got to know her father after his death via her exploration of his work, and especially his role in the Everest ascent. Which makes me thing another reason it resonated with me later might have been the mention of fathers and children. Looking at the dates, I read Frank’s post, and commented on it, just hours before I heard that my own father had died suddenly late on March 6th. The tenuous link is that I might – speaking, of course, totally without bias – be tempted to describe my father as another scientist who arguably didn’t get the recognition his achievements and ideas deserved. Anyway, some weeks later I spotted that Harriet Tuckey was on Twitter, and started following her and RT-ing some of her tweets about the book. Then, after the book was out, someone asked me if I would review it for Physiology News. No fee, of course, but “You’ll get a free copy’ they said. Of course, by then I had actually bought one, but I said yes anyway. Ultimately I did both the book review and a related longer piece noting the anniversary of the Everest Ascent and of Pugh and others reporting their scientific endeavours concerning the expedition to the Physiological Society. In the meantime, I discovered there was a scientific history session at the IUPS (big international physiology) meeting last Summer, discussing among other things the 1960-61 Silver Hut altitude physiology expedition which is probably Pugh’s greatest scientific achievement, So I trotted along to that and briefly met Harriet and two of the surviving expedition members, as I described briefly here. It has been a lot of fun to explore, albeit in a very superficial way, the ‘linked’ history of altitude physiology and high-altitude mountaineering. For instance, did you know you can find a paper of Pugh’s in the Journal of Physiology that tells you what Edmund Hillary’s alveolar oxygen tension (gas pressure) was at Camp IV. 21,200 feet (almost 6500 m) above sea level? Stuff like that. It’s somewhat revived my interest in writing about the history of physiology, which I used to do in regular ‘vignettes’ when I edited Physiology News, but had stopped doing when I stood down a couple of years ago. There are also many links to the physiology we teach the medical and science students. Hypoxia and the body’s response to it is a major challenge in medicine, then as now. And much of the experimental human physiology we teach and demonstrate in the labs uses the same kinds of equipment Pugh carted up Everest – large bags (‘Douglas Bags’) to collect exhaled air in being one example. The main difference is that now the bags are plastic, rather than the thin waxed cotton Pugh used in 1952-3. Talking of which, I could, erm, wax on about this kind of stuff for much longer, but I think it’s time to put this one to bed and have another glass of wine. This entry was posted in Blog-ology, History, Physiology, The Life Scientific, Uncategorized. Bookmark the permalink.